Find out what the average tuition charge is for American schools, and how Caldwell measures up. How Much Will Costs Rise? Get a good understanding of the tuition charges associated with Caldwell University in order to plan properly for the next 4-6 years. Check out the figures below to know how Caldwell University's cost measures up to other colleges and if you should plan for tuition increases. The following table outlines how Caldwell measures up to other schools nationally, regionally and by state. How Much Will Tuition & Fees Be for Caldwell? Full-time undergraduates at Caldwell University were charged $33,950 in tuition and fees for the 2017 - 2018 academic year, before adjustments for financial aid. $32,250 was the cost of tuition. $1,700 was fees. Regrettably, this school does not offer any discounts to students who live in state. Tuition and fees cover the expense of attendance for one academic year, but don't include room and board, which will be an extra charge you will incur if you live on campus. However, many students wind up spending less than full tuition after receiving financial aid and other discounts. Look at the following table to see 2017 - 2018 school year costs. How much does Caldwell cost part time? Visit the Part Time Tuition & Fees page for details. 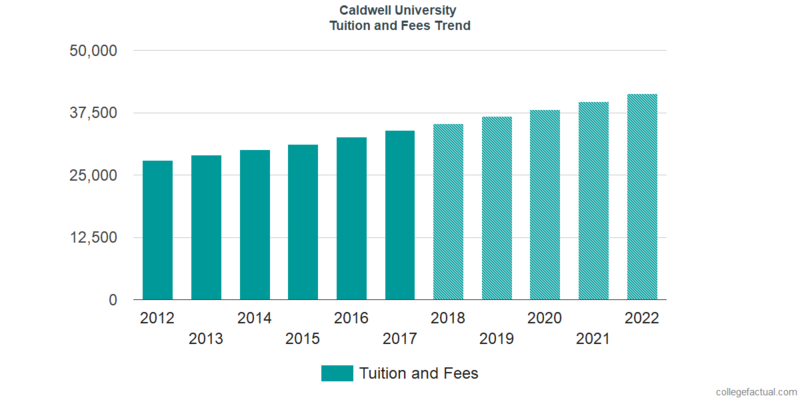 There has been an increase of 4.0% in Caldwell University tuition and fees for out-of-state students in the past 5 years. Tuition increased by 3.6% and fees increased by 13.3%. This year, students should anticipate paying $35,301 if the growth keeps up. Because of price increases, the full cost of a four-year Caldwell degree will be $149,861, and the full expense of a two-year degree would be $72,007, which doesn't include other costs for books, transportation, and room and board. Look at what upcoming tuition and fees will be for Caldwell students in the following chart. At a lot of schools you will end up spending more for your last year of college than you will in your first. This is due to yearly price increases. It pays to be aware!